“We are suffering just now from a bad attack of economic pessimism. It is common to hear people say that the epoch of enormous economic progress which characterized the 19th century is over; that the rapid improvement in the standard of life is now going to slow down — at any rate in Great Britain; that a decline in prosperity is more likely than an improvement in the decade which lies ahead of us. I spent a good chunk of the holiday break in a cabin with a spectacular view of a bay just off the Pacific Ocean outside the tiny town of Inverness north of San Francisco. It reminds me of the view from the cabin I grew up with in the American heartland, outside the Twin Cities in Minnesota. Looking out over the natural beauty of this amazing country of ours helped me think through the tumultuous past year with a big-picture, more timeless perspective. It helped me get clear about what lies ahead. The Brexit vote in England and then the election of Donald Trump, those two unexpected but consequential convulsions, are going to bring some big changes, many to be feared, but others to be welcomed. To my mind, both were driven by fear of the future and “a wildly mistaken interpretation of what is happening to us.” Both are going to make for some near-term chaos, but in the end I actually think they are going to accelerate changes that finally need to come. Trump is a symptom of something much bigger and more fundamental going on in the world. So are the people behind Brexit in Great Britain. They are not driving the change, they are reacting to the change. They are not showing the way forward, they are making desperate attempts to cling to the past, a past that is gone forever. The world is in the relatively early stages of an almost inevitable transition to what can be best understood as a new 21st-century civilization. Relatively early — meaning roughly one-third of the way through. And almost inevitable — meaning it can be derailed if we make some catastrophic political choices. There are three fundamentally different characteristics of this civilization: One, it will be run totally on digital technologies, smarter and smarter, more and more interconnected computers. Two, it will be totally global and operate on a planetary scale. And three, it will have to be sustainable, in its energy usage and its impact on the planet. All three of these shifts are well underway and can be tracked and explained by pointing to investments, the morphing of the advanced economy, the positioning of leading companies, and just following what innovative people are doing. In many ways, these developments are happening despite what governments do. Governments can make things better, and accelerate changes, or slow down changes, but they can’t stop them at this macro level. That said, politics can really screw things up. Changes of this magnitude can be very scary. New digital technologies allow totally new ways to do almost everything so they are very disruptive to old industries. The newest developments arriving just now are especially scary — self-driving cars, advanced robots, artificial intelligence. The globalization of everything is unleashing floods of cheap goods as well as waves of migrants. It’s easy for politicians to whip up public fears against these changes and rally people to go back to the old ways, to make America great again. This is the standard playbook for right-wing nationalism. In the 1930s, when Keynes wrote the prescient passage above, that era’s right wing took those fears and drove a good chunk of the world into fascism and a world war. Today Trump is heading down that path — but he won’t get far. I think Trump ultimately is going to do America and the world a service by becoming the vehicle that will finally take down right-wing conservative politics for a generation or two. He is getting the entire Republican conservative establishment to buy into his regime. He is creating an administration that is blatantly all about rule by — and for — billionaires, sold out to the oil and carbon industries, and celebrating an out-of-control corporate capitalism. It will be a caricature of conservative policies. In short order he will completely and irrevocably alienate all the growing political constituencies of the 21st century: the Millennial Generation, people of color, educated professionals, women. He’ll eventually do the same for a significant number of more moderate Republicans. And does anyone out there really think Trump will do anything for the white working class that got him elected? Watch as repealing Obamacare blows up in his face. I think the backlash will be fast and furious. And it won’t just be Trump that goes down — it will be large swaths of conservative Republicans who will be almost helpless to stop Trump or distance themselves from him. They will pay the price for creating the conditions that created him. I think the next 4 to 8 years are going to see a serious sea change in politics — to the left, not the right. The analogy is closer to what happened to the conservative Republicans coming out of the 1930s — they were out of power for the next 50 years. A Hillary Clinton win would not have brought about that kind of political transformation. She would have ground out some progress through trench warfare and built somewhat on Obama’s legacy— but the Republicans would have locked her down worse than they did with Obama. Hillary would not have been able to finally bring down the conservative movement and its archaic ideology. The conservatives arguably brought a healthy revitalization to Western politics in the Reagan/Thatcher era. But that vitality is long gone and the movement has been running on the same old out-moded ideas for decades now. The world needs to move on. Hillary would not have been the transformational leader that America needs right now either. We need leadership to help take the world to the next level, making the full transition to digital technologies, reshaping capitalism to rebalance massive inequalities, and making big progress on climate change. Where do we look for that leadership? Without outsiders taking much notice, California has gone through that political transformation, as usual, early. We were trapped in the polarized politics that paralyzed government in the 1990s and 2000s. We had the high numbers of immigrants who were scapegoated. We had a frustrated electorate elect a Hollywood celebrity with no government experience with Arnold Schwarzenegger. Been there, done that. Today California is totally run by a new generation of progressive Democrats. Every single state-wide office. Super majorities in both Houses. There are no conservative Republican elected officials to speak of in California right now. The conservative ideology, those policies, are dead. I’ve long been thumping the idea that California is the future. The San Francisco Bay Area is obviously ground zero for Silicon Valley and tech. It’s about as good a melting pot of global influences as anywhere on the planet. And it’s on the front lip of clean energy and sustainability. So that would be a good place to look for how those three massive 21st-century shifts will play out. In other words, to use the Keynes framework that started this piece, California is already living in the next economic period — and it’s booming. The next economy is working here — and working for the vast majority. Even the white working class is on board. Trump lost to Hillary in California by 4 million votes. Now add to that a state and local political environment where progressives have no meaningful opposition and an open field ahead of them. I think we’re going to see an explosion of innovation that roughs out a new way forward for the center-left in America and even has implications for Europe and the world. My company Reinvent is really fortunate to be in the middle of that swirl of possibilities. We bring together top innovators in deep conversations about how to solve complex challenges — and then make media about the ideas to emerge. We partner with forward-thinking organizations who want to generate new ideas and drive more innovation in a field. We also host What’s Now: San Francisco that each month focuses on the latest developments in one of the many fields exploding in innovation across the region. Look for innovation to now move into hyper-drive in the realms of government and politics throughout California — and particularly in the San Franicsco Bay Area. I know our company is working on ways to catalyze these kinds of conversations and do our part to reinvent political grand strategy along the lines of what I’ve been laying out here. But there are already many efforts popping up to move this next-generation politics forward. Now it’s possible that this whole analysis I have laid out is wrong. After all, I predicted that Hillary was going to win this last election. (Though who didn’t?) But it’s certainly worth seriously considering a scenario like this. Republicans clapping at Trump’s Inauguration should be very careful about what they wish for. Democrats wringing their hands in anguish should pause too. Stay open to counter-intuitive, out-of-the-box interpretations. Too few of us did last year. Be ready to make hard choices when unexpected new options open up quickly. We all may be faced with them soon. Brace for the big changes to come. They’re coming. Most of all, for those who supported President Obama, stay hopeful. I truly believe that the politics and policies that President Obama helped usher in will prevail in the end. 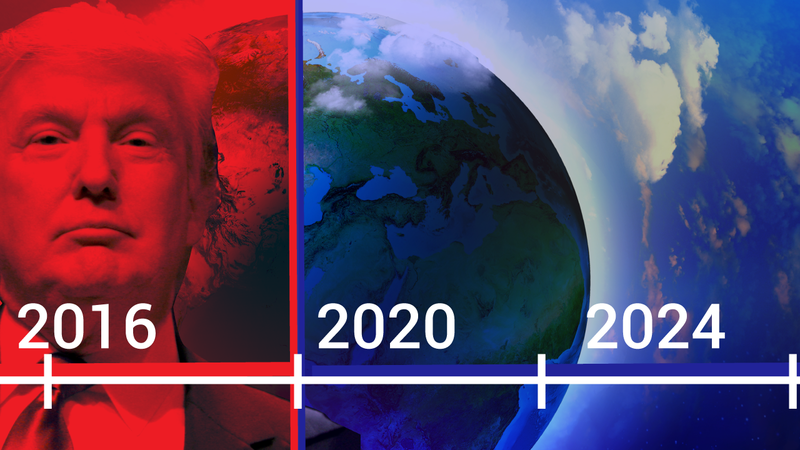 In the big-picture view of history, the brief Trump reign will be seen as a difficult but necessary step in the massive transition between one economic period to another. Obama’s decade of work will be seen, in the decades to come, as the truly enduring foundation. He laid the groundwork for what will certainly become the all-digital, fully global, sustainable civilization of the 21st century. Join us for NewCo Shift Forum, taking place Feb. 6–9 in San Francisco. We are bringing 400 of the best minds in business, technology, and government together for two days of focused, action-oriented dialog.